Audio recording of a lecture delivered on April 03, 2013 by Ralph Peters as part of the LCDR Erik S. Kristensen Lecture Series. Audio recording of a lecture delivered on April 09, 2014 by Francis J. West as part of the LCDR Erik S. Kristensen Lecture Series. 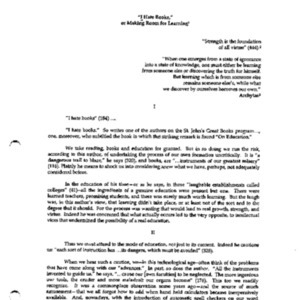 Audio recording of a lecture delivered on March 20, 1999 by Curtis Wilson. This lecture was given as part of the Isaac Newton Conference & Exhibition at St. John's College, March 19-21, 1999. Audio recording of a lecture delivered on Apr. 10, 2015 by Jonathan Shay as part of the LCDR Erik S. Kristensen Lecture Series. 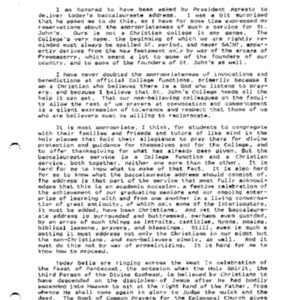 Transcript of a the address given on May 19, 1991 by James Carey as part of the Baccalaureate service in Santa Fe, NM. 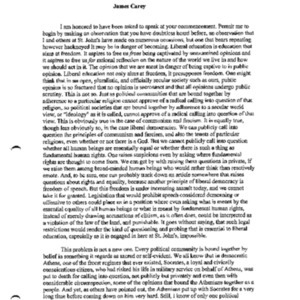 Transcript of the Graduate Institute commencement address given on August 15, 2008 by James Carey in Santa Fe, NM. Audio recording of a lecture delivered on April 13, 2016 by Seth Cropsey as part of the LCDR Erik S. Kristensen Lecture Series. Audio recording of the commencement address given on May 21, 2016 by Eva Brann at the end of the Spring 2016 semester in Santa Fe, NM. 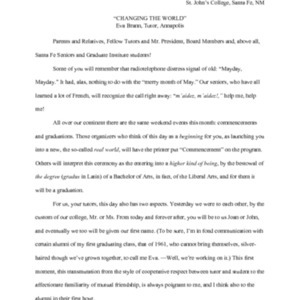 Typescript of the commencement address given on May 21, 2016 by Eva Brann at the end of the Spring 2016 semester in Santa Fe, NM. 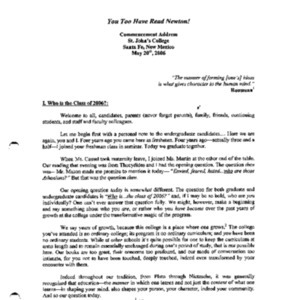 Transcript of an address given on May 21, 1999 by Stephen Van Luchene as part of the Baccalaureate service in Santa Fe, NM. 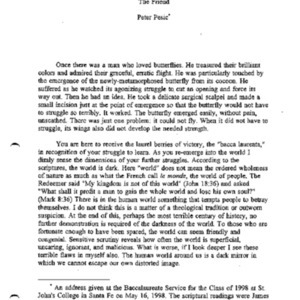 Transcript of an address given on May 16, 1998 by Peter Pesic as part of the Baccalaureate service in Santa Fe, NM. 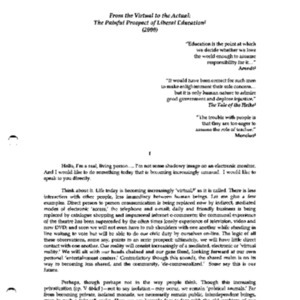 Transcript of the Graduate Institute convocation address given on June 15, 1997 by David Levine in Santa Fe, NM. You too have read Newton! Transcript of the commencement address given on May 20, 2006 by David Levine in Santa Fe, NM. 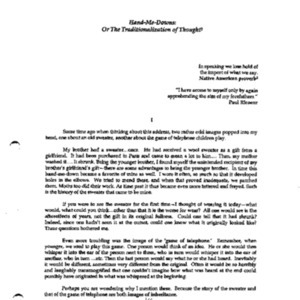 Transcript of the Graduate Institute convocation address given on June 14, 1998 by David Levine in Santa Fe, NM. 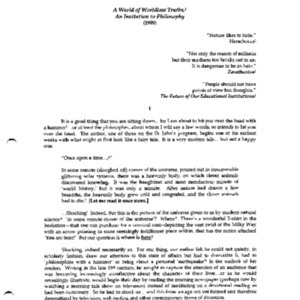 Transcript of the Graduate Institute convocation address given on June 20, 1999 by David Levine in Santa Fe, NM. 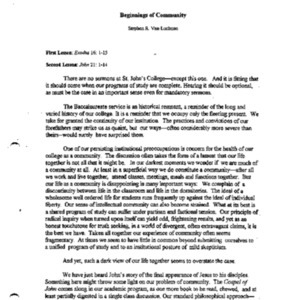 Transcript of the Graduate Institute convocation address given on June 18, 2000 by David Levine in Santa Fe, NM. Audio recording of the Graduate Institute commencement address given on August 5, 2016 by Natalie Goldberg in Santa Fe, NM. 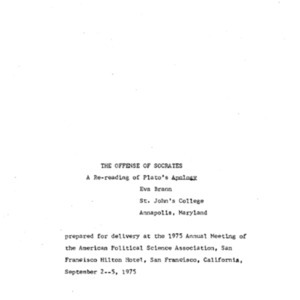 Typescript of a lecture delivered on September 02, 1972 by Eva Brann at the 1975 Annual Meeting of the American Political Science Foundation. 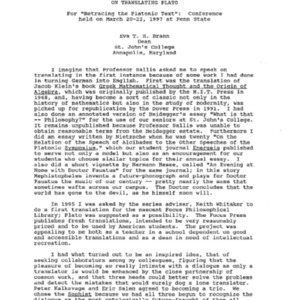 Typescript of a lecture delivered in March 1997 by Eva Brann at the "Retracing the Platonic Text" conference held at Penn State.